Parties are one of the biggest culprits when it comes to creating unnecessary waste. It might be easier, and possibly cheaper, to grab disposable everything for your next big bash, but is it really worth it? Why not go all in and pledge to throw an entirely zero-waste party? Contrary to what you might think, it can be done without too much difficulty — check out the tips below. It’s about time to ditch the classically themed paper invitations, as they are almost always thrown away immediately. For casual parties, it’s pretty easy to invite people to your event via social media or email, which also allows you to organize and manage RSVPs all in one place. If you still like the idea of sending out personalized invitations, opt for an e-vite service that will allow you to design something that matches your theme. Planning extra-special occasions, like weddings, graduations and first birthdays? Stretch your DIY muscles by making your own seeded paper. Guests will likely be thrilled to receive a card that they can plant anywhere instead of tossing it, and you can customize it with all sorts of seeds, from wildflowers to edible herbs. Yes, paper plates and plastic forks are convenient. There’s no denying that fact. However, we all know they’re not great for the earth, and there’s definitely a better way to go about getting food and drink into your guests’ bellies. Most of us don’t have a coordinated fine china set that’s meant to feed the masses, but that’s okay. Your guests will just be happy that there are refreshments in the first place. 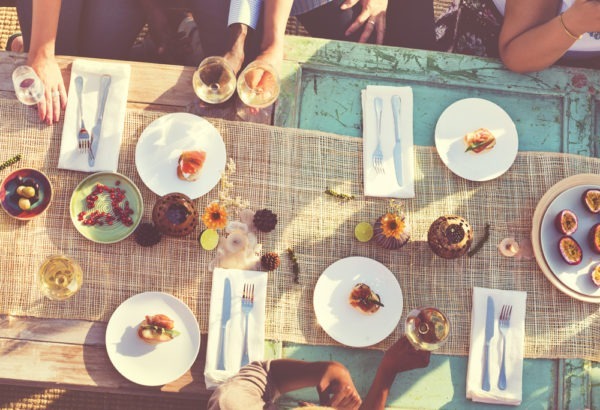 If you don’t have enough plates, bowls, silverware, and cups (matching or otherwise) to feed your entire party, ask people to bring some of their own, or knock on a neighbor’s door and see if they’re willing to pitch in for the day. If combining resources still won’t provide an ample supply, or if the event definitely calls for coordination, rent everything from a party rental store. It’s not as expensive as you think, and your local landfill will thank you for the investment. If you’re serving non-alcoholic drinks, a good rule of thumb is to provide 8 ounces for each child and 16 ounces for each adult of a special beverage, and then have ice water available for those who are still thirsty (obviously, bottled water is a no-no here). It may seem a little skimpy, but if it’s a sugar-laden beverage, all the parents will thank you for limiting its supply. Making your own lemonade or punch and serving it in glass pitchers or a punch bowl will reduce waste, especially if you try to find ingredients that come in reusable glass containers. When it comes to alcoholic beverages, you’ll want to be more liberal with the supply. In order to reduce leftovers and wasted half-empties at the end of the night, use this formula to provide the perfect number of drinks for your event — the basic gist is one drink per guest per hour. When shopping, choose liquors that come in swing-top glass bottles, as they are much more reusable than traditional screw-top bottles. Wine bottles are also reusable with a supply of corks on hand, and there are plenty of fun ways to repurpose them. If you’re going with beer, that’s fine. There doesn’t have to be any technical “waste” if you recycle every last bottle, can and a cardboard box. If you’re picking up six-packs, be sure to seek out ones with either recyclable plastic, biodegradable or edible six-pack rings. The days of wildlife getting stuck in those plastic nooses are, hopefully, well behind us.